Henniker Plasma would like announce the launch of their new, cost effective bench-top plasma cleaner for TEM sample preparation tasks. 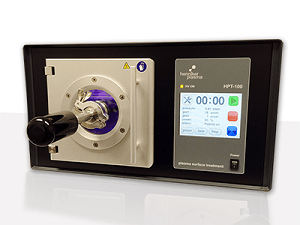 The HPT-100 TEMCLEAN is a bench-top glow discharge system that is suited to the routine cleaning of TEM sample holders/grids as well as for cleaning and preparation of other individual items. The system features interchangeable re-entrant style adapters for JEOL and FEI sample holders and also a removable parts carrier that can accommodate up to ten 25 x 75mm glass microscope slides. Operation is via an intuitive colour touchscreen interface providing full automation of the cleaning cycle and with accuracy and repeatability guaranteed by microprocessor control of gas mixing ratio, pressure and applied plasma power. Controlled cleaning has been independently verified and shown to be particularly effective for the removal of hydrocarbon contamination in a holey carbon grid sample in collaboration with the Microscopy group at Johnson Matthey Technology Centre. It offers amazing control over how much carbon is removed from samples. Henniker’s plasma systems are in use all over the world and backed by comprehensive specialist support. We are an experienced, dynamic and expanding company already established as a leading UK manufacturer of plasma treatment systems for cleaning, activation and coating. Our success is built around an exceptional body of knowledge and expertise, backed by highly trained and dedicated staff who understand your application in considerable detail. Our standard configurations cover most applications but we understand too that no two samples or surfaces are the same. That’s why, uniquely, we offer a wide range of options that allow us to customise any standard system for your exact requirement.